Party season is just around the corner, it’s time to start practising the smokey eye look! This week we’re crushing on Sonakshi Sinha’s sultry brown smokey eyes. So, we reached out to Plixxo influencer and celebrity make-up artist Namrata Soni and got her to spill the beans on how she got the look. She also tells us ALL about her absolute favourite make-up products and gives us step-by-step deets on creating a stunning brown smokey eye. This is pure gold ladies, keep reading! “The secret is hydrated skin! Follow the rule of 30. Give your skincare 30 minutes to sink in,” says Namrata. “Sonakshi has dry skin; to prep her face I used Indulgeo Rose Gold Daily Oil (Rs 1,280) followed byIndulgeo Rejuvenating Eye Serum (Rs 550). Give each product about 15 minutes to sink in and work its magic. I cannot recommend the Indulgeo Rose Gold Oil enough, it is my secret weapon! I used the Bobbi Brown Corrector - Peach (Rs 2,650) and topped it off with a little bit of concealer from Laura Mercier (Rs 1,900). Sonakshi has beautiful skin, I airbrushed a light layer of foundation to give her skin some coverage and Charlotte Tilbury Filmstar Bronze & Glow (Rs 5,371) to highlight and bronze her skin. I smudged a generous amount of the Tom Ford High Definition Eyeliner (Rs 3,000), on both her waterline and eyelids. This is what created that stunning brown smokey eye. For eyes, I swear by Ardell’s Individual Lashes (Rs 374) and the Shu Uemura lashes (Rs 1,359). I absolutely love the Bobbi Brown No Smudge Mascara (Rs 2,750) you can literally swim in it and it won’t budge! For lips, I used the Bobbi Brown Art Stick (Rs 2,600) in the shade Dusty Pink. I dabbed the lipstick with my fingers to give her lips a lived-in look!” says Namrata. 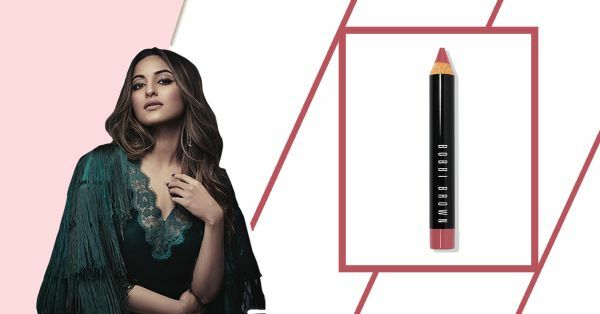 “Sonakshi fell in love with the Bobbi Brown Art Stick in the shade Dusty Pink!” says Namrata. In the meantime, check out how to get the perfect smokey eye here and here. In case you want to go pro, check out a stunning smokey eye on Diana Penty.